Apparently I will be making an appearance as THE VOICE OF THE INTERNET! I'd love to go, but work schedule says a big no. Any chance of filming, or recording it, Paul? Chris & I were chatting about it today (while recording News from Pnakotus 26). It will certainly be recorded and a strong possibility it will be filmed (along with a live audio broadcast of the main show segment). I'm going. Really looking forward to it. Not only will it be great to see Chris, Chad, Andrew and the Yoggies in the flesh, but I get to meet up with an old friend from York too. Win. Win. Now all I have to do is figure out where I can park in Leeds that's within walking distance of the venue but won't cost me half a year's salary in parking fees for the evening! Great news for those of us on the other side of the world! We will be using the Yoggie Chat Room for realtime interaction with the online audience (link at top right of site when logged in). Remember to use it, you must be logged into YSDC. One advantage of using YSDC chat is that it will also work on Apple devices (as it's not Flash-based). The Yog Radio 2 audio stream itself can also be picked up on iPhones/iPods/smartphones too. YSDC Patrons should also keep an eye out for behind-the-scenes updates via the @YSDCPatron Twitter account. I'll be attending and am very much looking forward to it. Just the perils of the M62 and finding a car park to negotiate (like Scarecrovv). There's a multi-story (24 hr I think) just around the corner from the venue but as my car will likely be in there for possibly up to 8 hours, it'll depend very much on what the rates are. I'm thinking of finding a residential area within a mile or so of the venue and parking there, maybe. Busses and Trains are the obvious answer but I'm hoping to stay quite late and don't want to be restricted by a timetable that most likely will end around 10 pm. There ain't much parking street parking in Leeds at all, used to be a cheap/free (in the evenings) one at the top end of the city near the Templar Hotel, but I ain't used it for a while so I can't say what the charges may be now. Also I will be coming along with two other Yoggies, if time allows maybe a little Yoggie meet could be swung in to action? I believe people are heading over to the FAB Cafe after the event for more chat & some drinks. As Andrew Leman of the H.P. 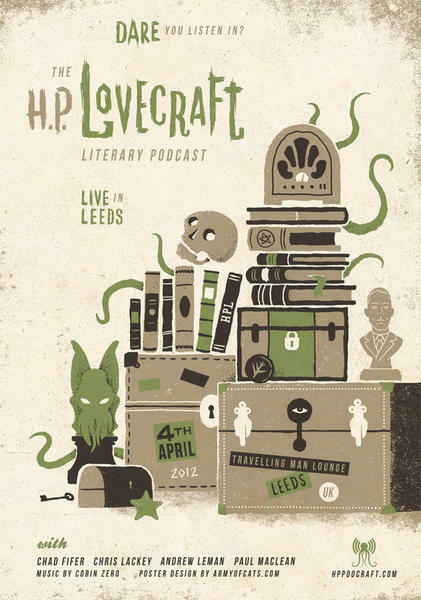 Lovecraft Historical Society will be at the event, if you're there I'm sure he wouldn't mind signing the odd Poster or DVD. While current stocks last at Innsmouth House! Will YSDC be selling stuff there aswell? Also, what time do you expect the HP Podcraft event to wrap up and the exodus to Fab Cafe begin? For the first part, the answer is likely that we won't, since it's a space run by another retail outlet (Travelling Man - who also sell Lovecraft materials). Also I expect I'll have my hands full running the net tech! I'm not sure what the timings are yet, Chris & Chad will know more. Five new tickets have been re-allocated to the Innsmouth House shop. - and that's the last of them! That's it we're out of tickets at Innsmouth House! A poster for the event (which is next Wednesday)! Great poster, looking forward to it. Oh My, this shall be fun! I've been waiting for the Live Show since They first announced it! And it's going to be happening just a day or two after My copy of Thom Ryng's "The King in Yellow" comes in the mail! The only way this could get better is if there's video. The live show is due to start at 7 PM (or a little after) on Weds. 4th April. 7 PM (19:00) is British Summer Time (BST) so it's actually 18:00 GMT (Universal/Zulu Time). World Clock | Time Now is handy to work out relative time differences. Should all the network widgets work correctly (as they did in testing), then the show should be live broadcast via Yog Radio 2. We have 250 slots available, so first come, first served! Live chat will be going on during the show (moderated by me) via the YSDC Chat Room. As I'm able, I also plan to monitor any mentions made on Twitter. Yoggie Patrons may also get extra info before & after the show via the @YSDCPatron account. The show will also be recorded for later broadcast. I'll still be at work when you guys are doing the live show (2 pm where I am), so I'll have to console myself knowing that a recording of the event will be coming to my feed shortly. This sounds like so much fun! Yog Radio 2 also streams over Port 80. You can easily pick up the stream via net connected smartphones and media players too. There had to be some advantage to being an Innsmouth House Newsletter subscriber. An April Newsletter has just gone out with an individualised QR Code in it. Any Innsmouth House Newsletter subscribers who bring along a copy of their QR Code to HP Podcraft Live can pick up a free Yoggie black pencil from me! Curses! Not only can I not attend the event, not only can I not even tune in to listen to the live broadcast tomorrow, now you taunt me with free pencils!